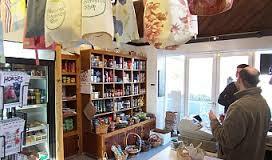 We are a local Community Shop set up in 2006 (see below for our history) and run by a small committee, with two part-time paid managers and a wonderful team of around 20 volunteers. The shop sells a wide range of groceries, fresh and frozen local produce, local damson items, Suma and Ecover ranges, bird nuts, greeting cards, stationery, tobacco, kindling, walks and cycle leaflets and the Westmorland Gazette. We cater for the many cyclists that pass our doors – see below for cycle route details and our cycle-friendly items. Our homemade cakes are legendary and are provided by a team of local bakers, together with sweet and savoury items from the team at Oversands School – see below for details. You can order Higginsons/Grange Bakery/Aireys goodies, as well as any other regular items. We recycle batteries and arrange dry cleaning. We also promote community activities, host the Parish Council planning folder, bus timetables and tourist information. Before 2006, Witherslack had a shop and Post Office operated from a house in the village. When the owners decided to retire and sell the house, the village was due to lose both shop and Post Office. Villagers decided to set up a co-operative to buy premises and run both themselves. Grant funding was applied for and money was raised by the sale of shares – mainly to local residents. A local property was earmarked for purchase and the ambitious plan was to adapt the existing building on that plot to provide a spacious shop with an area where people could meet for a coffee, thus fulfilling a social need as well as providing a retail outlet and the much needed Post Office. Unfortunately, the target sum was not achieved. The project was relying on significant funding from none other than Northern Rock. The failure of the bank meant that its grant giving arm was significantly reduced. This also coincided with the decision of the Post Office to close a large number of rural branches. With the Witherslack branch temporarily closed, it was an easy target to cut. Undaunted, residents went ahead with modified plans, albeit on a smaller scale. A new tenant was planning to take on the village pub, which had been closed for well over two years. The new landlord leased a small outbuilding attached to the pub to turn into the village shop. The aim was to provide a convenience store serving the local community and also give people the opportunity to meet others: Witherslack is something of a scattered community and, especially for some older residents, the closure of the shop and Post Office, risked isolating them. The work to convert the premises was done by local volunteers, who fitted it out, painted it and did all that was needed. Three local women between them shared the job of manager and volunteers took on the job of staffing the shop at other times. A very generous grant from the Lake District National Park Authority and smaller, but no less welcome, grants from other bodies (including a sizeable one from the Plunkett Foundation) made all this possible. The Witherslack Community Land Trust also played a significant role, having acquired both the site originally planned for the shop with the aim of selling it on to the co-operative, and later the pub premises which they leased to the landlord with the hope that the shop would find a home there. The shop opened its doors in August 2008. From an early stage local produce – e.g. preserves and juices from Moss Howe Farm, locally sourced meats and, most particularly, homemade cakes baked by volunteers – has been a feature that makes it much more than just a convenience store. The shop stocks local wild venison and produce from Higginsons butchers and bread from Grange Bakery. It has also, true to the original vision, provided a place where people can meet other villagers and where local activities/societies can spread the word about what they are doing. The boys of Witherslack Hall School (a local residential school) also started baking for the shop and preparing ready meals, which are proving very popular. The road has not always been smooth: the financial crisis has hit the shop in much the same way as it has affected small businesses everywhere. In addition, the decision by the local garage on the A590 to take over what had previously been a restaurant/snack bar and extend into it to create a mini-supermarket has undoubtedly had an effect on the level of trade in the Community Shop, but we are weathering the storm and just need the whole community and visitors to get behind the shop and guarantee its future. The shop has forged very successful links with Oversands School pupils. A group of food technology students at the school has set up a business enterprise that has involved supplying the shop with incredibly good cakes every Thursday. They also supply us with ready meals – lasagne, curry, cottage pie, soup, etc. All of this has proved to be a huge hit with our customers. Rachel Stokes, joint manager of the Community Shop, praised the pupil's efforts, saying: "It's been brilliant. All the local people are so impressed by the pupils and the quality of their baking and delicious ready meals. The minute we receive new items from the pupils they are flying off the shelves, they are so popular. The best thing, though, is that they are providing such a great service to our customers and the young people are now an important part of our close-knit community". and look forward to it continuing.